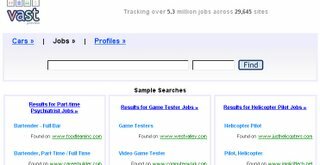 Vast is a search service that scour the web across millions of sites and billions of pages to find nuggets of information - jobs, cars, people, and other classifieds, and offer the resulting database to end-users and other web sites. It currently offer the largest database of cars and jobs, and one of the largest databases of people profiles on the entire Internet. It is a crawler, a digger online.